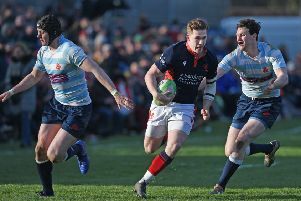 Currie’s hopes of winning the Premiership’s fourth and final play-off place are still alive after they toughed out a hard-won victory against Hawks to stay hard on the heels of Heriot’s for that precious place. A bonus-point win against Boroughmuir in a last re-arranged league match will mean they go into the play-offs. Defending champions Heriot’s, who also won yesterday at Stirling with a bonus point, sit four points ahead and can do no more. The last time Currie and Hawks met in the league they shared 11 tries and 63 points and Currie nicked it by one point. This time round there was no repeat of the high scoring, although Currie ended with a two-try flourish after a gritty second-half performance. The home pack stamped their authority on the scrum from the outset, winning a penalty that gained good territory and tested the defence before winger Ben Robbins found a gap that took Currie deep into the Glasgow 22. Nothing came of that attack but Currie persisted and the first try was scored on the right by full-back Harvey Elms as Hawks ran out of tacklers. Jamie Forbes missed the conversion. Glasgow stand-off Hagen Schulte missed two long-range penalty attempts from near the halfway line on either side of the half-hour mark. The visitors almost opened their account as Schulte fed Paddy Kelly on the left wing but Currie captain Ross Weston got across to knock him into touch at the corner flag. It only delayed matters, though, and Hawks scored in the next move when full-back Sean Yacoubian went over in the opposite corner. The conversion was short and it was all square at half-time. The game restarted at a furious pace and Currie kept up the momentum by kicking for the corner rather than attempting a penalty from the Hawks 22. It only resulted in an untidy lineout but the ball was flung through a series of hands to the opposite side of the pitch, where Elms was squeezed out at the last minute. Heroic defence by Hawks stymied Currie at every turn until they won a penalty at a ruck only ten metres from the line. Forbes took the points and a lead that would not be relinquished. Hawks found new reserves of energy and manoeuvred themselves into the danger area, gaining ground with short passes around the rucks. They won a penalty on the Currie 22 but Tommy Spinks fumbled it as he tried to tap and go and the chance was gone. The players were visibly tiring and more and more mistakes began to creep in. Forbes put Currie six points ahead with a 25-metre penalty that eased the pressure as the floodlights came on. A try by Robbie Nelson with less than five minutes remaining clinched the victory, with Forbes’ conversion hitting both posts before going over. Ben Robbins added a third try in injury time and Forbes a final conversion.